Teach you how to print a doucment, Click Page Setup on the File menu. Click Print Setup tab in the Page Setup dialog. In the Print Setup table you can, click the Edraw Main Button , point to the arrow next to Print, and then click Print Setup to see if your drawing page and printer paper work together the way you want. Note: Changes you make to options on this tab apply to the current page only. Lists the paper sizes supported by the current printer as well as industry standard sizes. You can select Same as printer paper size on the Page Size tab to make changes to the paper size also apply to the drawing page (drawing page: The page in a drawing window that contains a drawing. A page can be either a foreground or a background page. Each page has a size, which usually corresponds to a standard paper size, and it has a scale size. Specifies the paper orientation as portrait or landscape. You can select Same as printer paper size on the Page Size tab to make changes to the paper orientation also apply to the drawing page orientation. Opens the Print Setup dialog box, where you can select printing options such as the margins, centering, printer, and paper source. Reduces or enlarges the contents of the drawing to a specified percentage of actual size for printing only; your actual drawing page size is unchanged. For example, to reduce a drawing to three quarters of its original size, type 75. Fits each drawing in the print job on the specified number of sheets across and down. Depending on the number of pages and the margins you specify, the drawing is enlarged or reduced. If the pages across and down are not proportional to the drawing's dimensions, only those sheets needed to maintain the drawing's proportions are used. Displays a thumbnail of how the printer paper and drawing page are currently set to work together. You can exactly match the printer paper and drawing page. 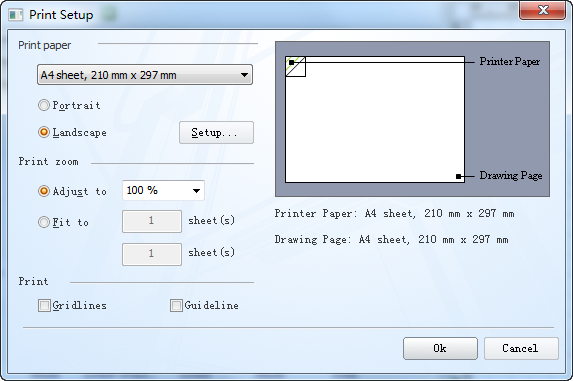 Lists the current printer paper settings, including paper size and paper orientation. Lists the current drawing page settings, including page size and page orientation. You can change these options on the Page Size tab. Lists any reduction or enlargement that you specify. Change this setting under Print zoom (all pages). This option only affects your printout; your actual drawing size is unchanged. Note that when you reduce or enlarge a scaled drawing, you cannot use the printout to measure real-world objects accurately. Click the File, point to the arrow next to Print, and then click Print Preview. Tips: If you aren't satisfied with the result, you can change the print options in the Print Setup dialog. Click the File, point to the arrow next to Print, and then click Print Setup.